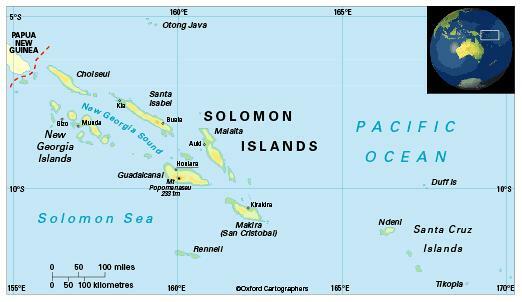 Solomon Islands, an archipelago in the south-west Pacific, consists of a double chain of rocky islands and some small coral islands. The major islands are Guadalcanal, Choiseul, Santa Isabel, New Georgia, Malaita and Makira (or San Cristobal). Vanuatu is the nearest neighbour to the south-east where the archipelago tapers off into a series of smaller islands. Its nearest neighbour to the west is Papua New Guinea. The country comprises the capital territory of Honiara and nine provinces, namely Central (provincial capital Tulagi), Choiseul (Taro Island), Guadalcanal (Honiara), Isabel (Buala), Makira and Ulawa (Kirakira), Malaita (Auki), Rennell and Bellona (Tigoa), Temotu (Lata) and Western (Gizo). Equatorial – hot and humid. During the rainy season (November to April) there are fierce tropical storms, for example Cyclone Zoë in December 2002, which devastated the isolated islands of Tikopia and Anuta. The most significant environmental issues are deforestation, soil erosion, and that much of the surrounding coral reef is dead or dying. 550,000 (2012); 21 per cent of people live in urban areas. The population growth rate stood at 2.6 per cent p.a. between the years of 1990 and 2012. In 2012 the birth rate was 31 per 1,000 people (46 in 1970) and life expectancy was 67 years (54 in 1970). Solomon Islands is classified as a lower-middle-income economy by World Bank.